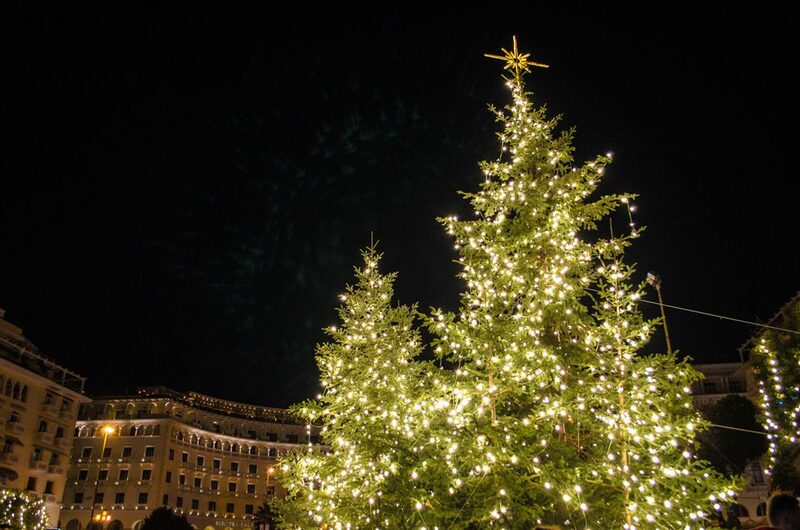 Of course, there is the Christmas tree and the usual festive decorations, but the tree is a relatively recent international addition- credited to King Otto who hailed from Bavaria. In Greece, this nation of seafarers, so many people worked on the ships- as fisherman, or on commercial boats in all corners of the world. A boat coming into harbor is a symbol of family being reunited, an image that stirs the hearts of Greeks. 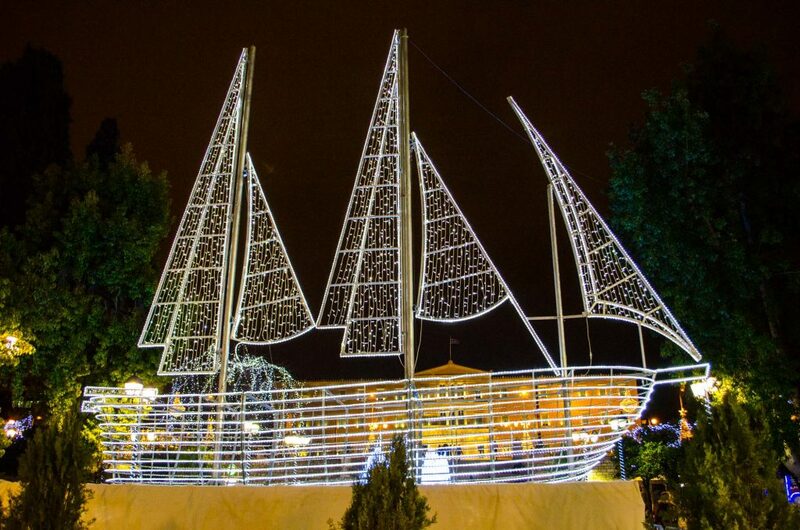 A decorated boat is the most authentic symbol of the season. 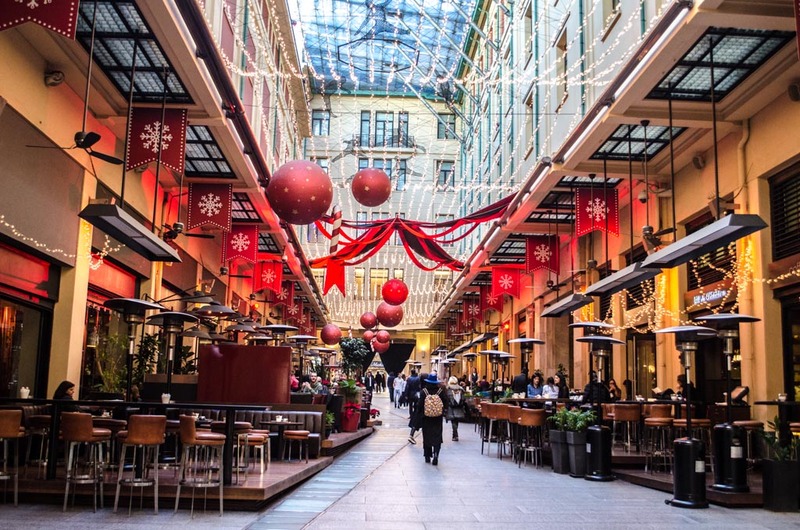 A kindly old man with a white beard and a red suit delivers presents in Greece too, but not on Christmas- Christmas is centered around the birth of Christ. 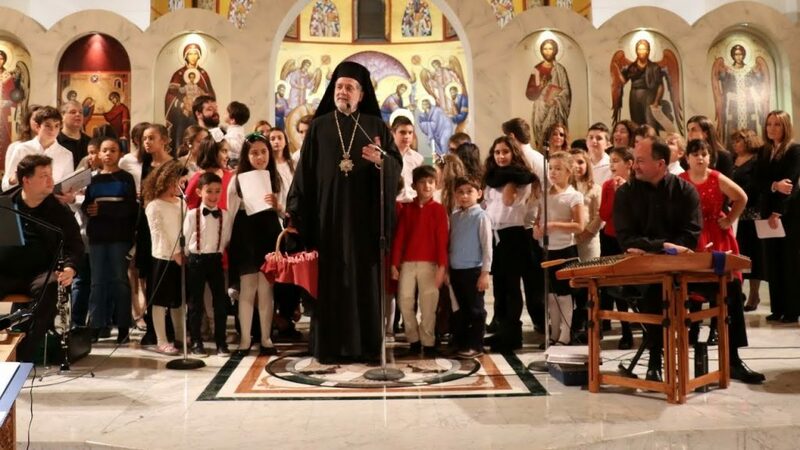 Presents are delivered by Agios Vasilis, whose name day is celebrated on January first. 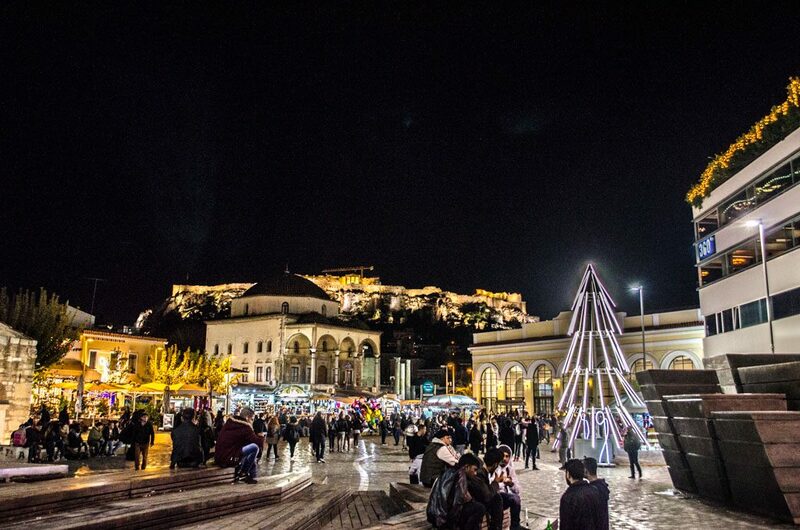 Agios Vasilis visits houses on New Year’s Eve. 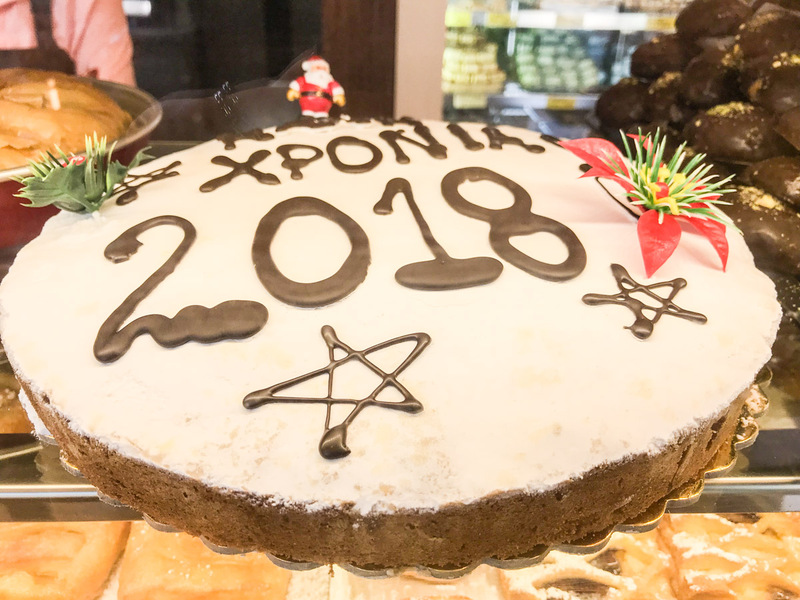 Agios Vasilis’ day is also celebrated with a cake, called a Vasilopita. Either a sweet cake or a sweet, eggy tsoureki-like bread, this large festive sweet has a coin hidden in it. 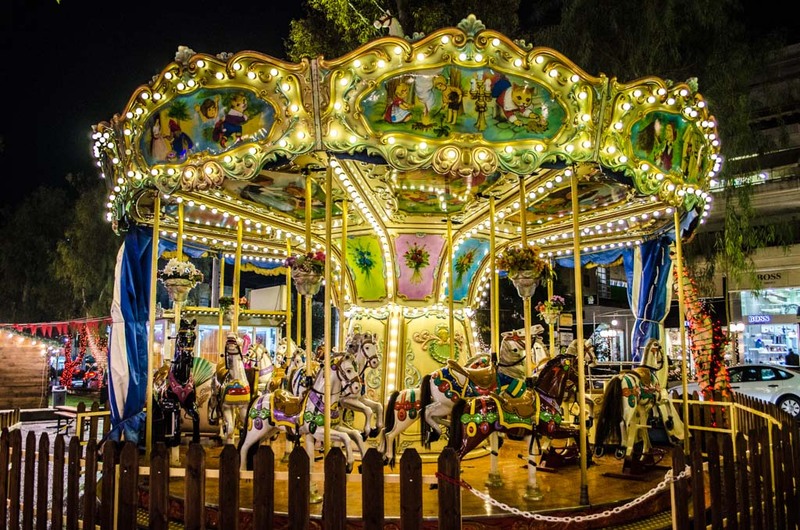 Pieces are assigned for everyone in the household, plus the baby Jesus and Agios Vasilis, and the good fortune of the year goes to the one who finds the coin (the good fortune of Jesus or Agios Vasilis is shared by all!). 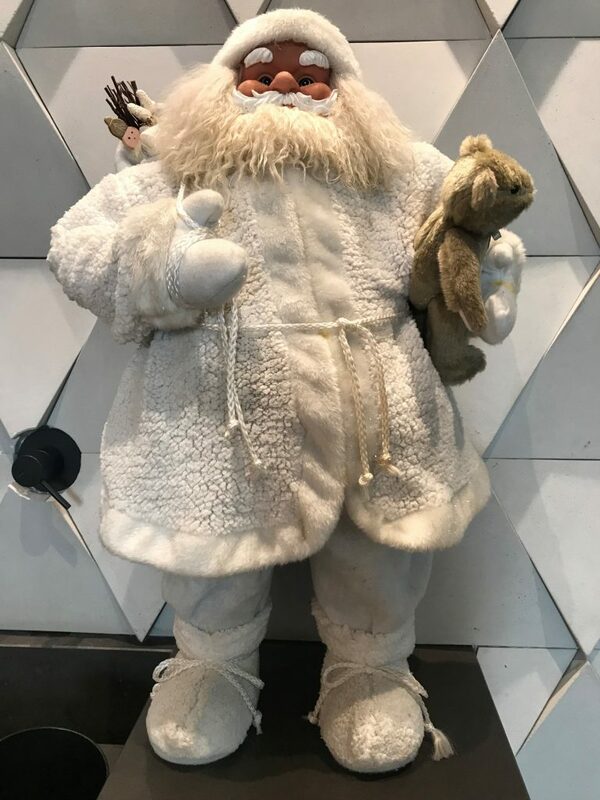 Not the cheerful toymakers of the North Pole decked out in red and green, the Kallikantzaroi are tiny mischief makers that wreck havoc after dark throughout the 12 days of Christmas. These tiny black long tailed troublemaking goblins are known throughout the Balkans. Keeping a Yule log burning in the hearth throughout the holidays is thought to be a god way to keep them at bay- they love to come down chimneys. In most countries, the selection of holiday cookies is very large. In Greece, there are basically two. Two is all you need though if they are absolutely perfect: These two classic Greek Christmas cookies are nothing alike- one is crumbly and buttery, the other spicy and moist. 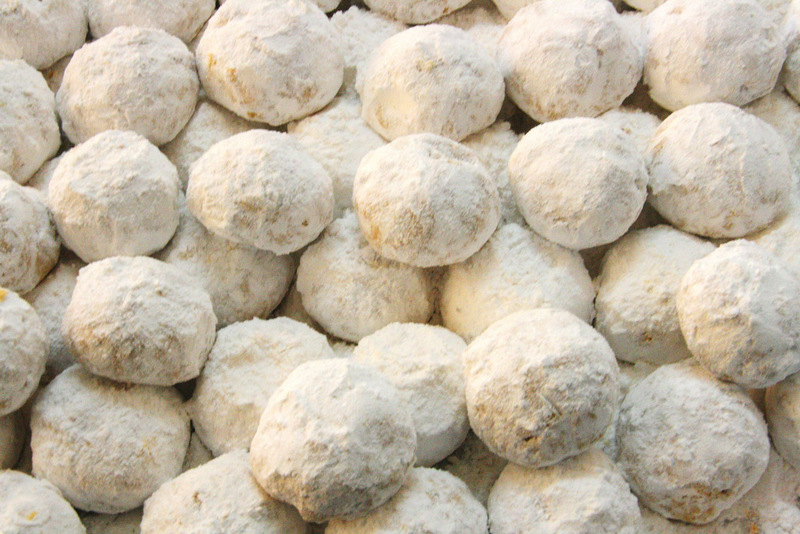 Kourabiedes are butter cookies rolled in powdered sugar – they melt on the tongue like a snowflake. Melomacarona are “honey macaroons” (‘meli’ = honey)- spicy cookies scented with cinnamon and cloves, stuffed with walnuts, and moistened with honey syrup. 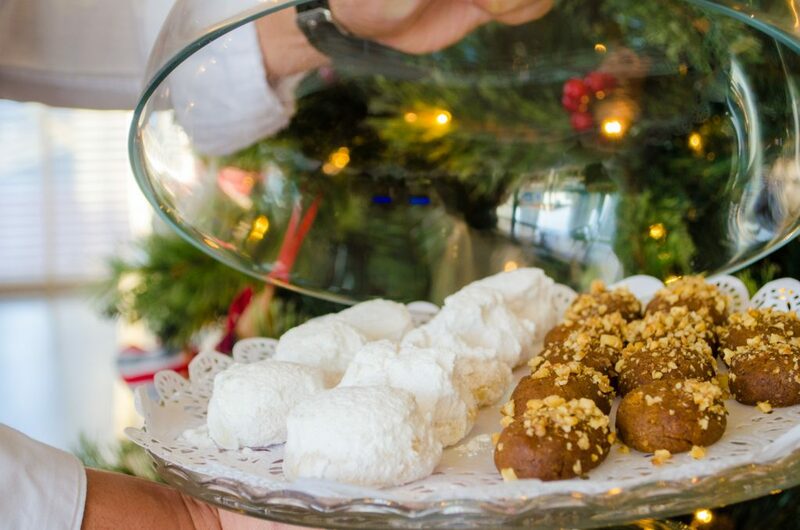 Mounds of each type of cookie are found not only in every Greek home during the holidays, but also at cafes, bars, and sometimes even the local hardware store. Just as the Christmas cookies are limited in scope but perfect, so are the Christmas carols, or rather carol- there is just one for Christmas, and another for New Year’s, and yet a third for Epiphany. The song is beautiful, but the best part is the tradition of caroling- children go door to door, wearing Santa hats and playing triangles while they serenade the household. It’s a long song- it’s totally okay to give them some coins and good wishes before they get through all of the verses. In fact, they’ll appreciate it- “kalanda’ is not just a sweet tradition- it’s also good business! The custom is not as strong as it once was, epically in the larger cities. 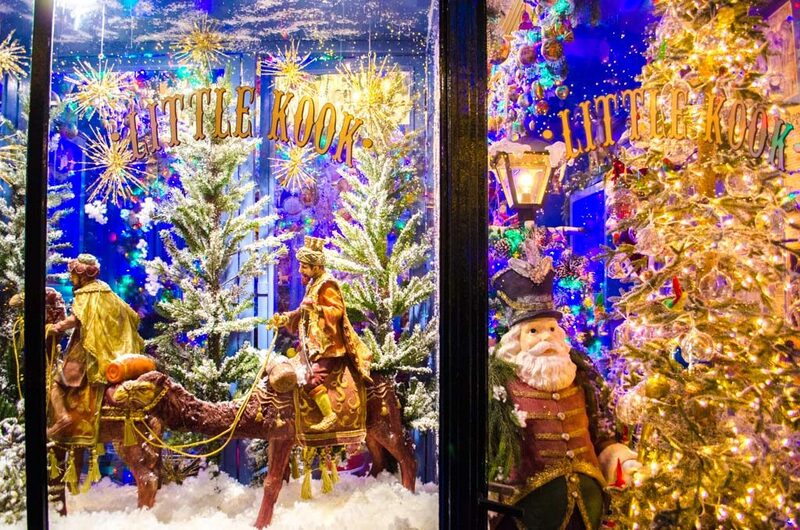 But you’ll still see groups of children serenading neighborhood shops and even boarding the buses to spread a little holiday cheer. Save up your change if you’ll be outside on Christmas Eve day or New Year’s Eve day so you have something to give them. And speaking of being out, you definitely should be- these are wonderful days of the year. This of course is both a custom and usually a necessity in many countries. 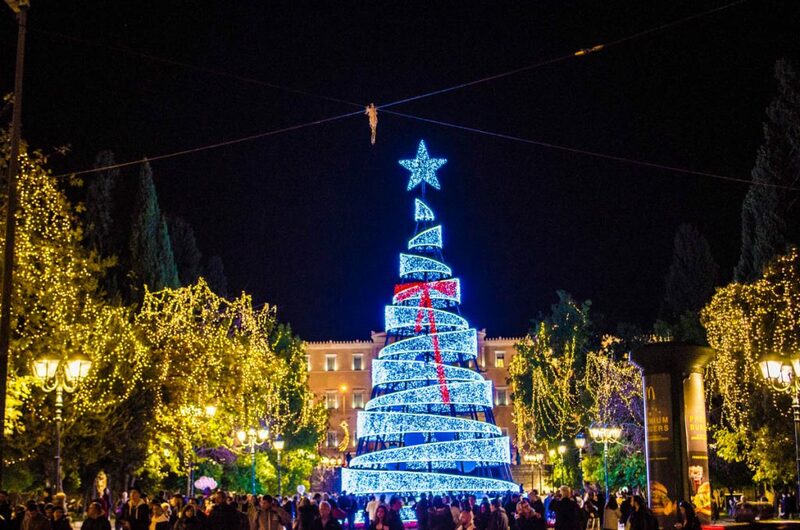 But the Greeks do it with verve- carolers, bands, and djs fill the streets. By noon, almost everyone has picked up their last minute cheeses or the meats they had on order, and are meeting with their friends. Everyone is loaded down with parcels and lightened with wine and good cheer. The streets fill with the scent of grilling chops as restaurants and bars move the action into the streets. 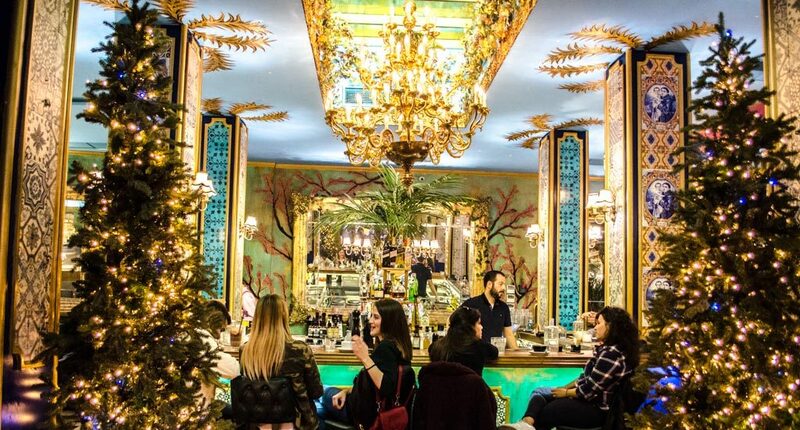 The cafes and bars are at their shimmering best too- stop in for a glass of prosecco and, of course, some melomacarona. Have you ever been in Greece for the winter Holidays?